Stottler Henke has received numerous awards from US government agencies and industry for its innovative, artificial intelligence technologies and solutions. the Hallmarks are stories featuring successful companies and the successful technologies developed through participation in NASA’s Small Business Innovation Research (SBIR) and/or Small Business Technology Transfer (STTR) programs. These stories serve as role models for other companies, as well as being prime examples of investing federal dollars in research and development that eventually is infused back into government programs and into the commercial marketplace. NASA Automated Manifest Planner (AMP) plans space shuttle missions. U.S. Air Force SimBionic® enables student modeling, situation assessment, and automated control of simulations and real-time systems. U.S. Air Force WarCon / SimVentive™ enables enables authoring of instructional, multimedia (“serious”) games with rich user interfaces and sophisticated simulation behaviors. U.S. Army EnvKB helps architects design environmentally friendly buildings. U.S. Navy Tactical Action Officer ITS evaluates the tactical decision-making skills of naval officers during training simulations. U.S. Navy Acoustic Analysis ITS teaches undersea acoustic analysis to navy sonar technicians. U.S. Navy PADAL helps landing signal officers (LSOs) guide aircraft landing aboard carriers. MS&T Magazine named Stottler Henke one of two Small Business of the Year finalists in its Simulation & Training Awards 2018, recognizing Stottler Henke’s AI-based Intelligent Tutoring System software solutions for intelligent, individualized military training. Stottler Henke was named one of the “Top 100” companies making a significant impact on the military training industry by Military Training Technology magazine for 2017 and twelve previous years. Stottler Henke is a leader in the research and development of artificial intelligence-based training applications and rapid development tools for scenario-based intelligent tutoring systems and intelligent simulation control. Stottler Henke has received a Blue Ribbon from Military Training Technology magazine, recognizing it as a company that leads the industry in innovation. 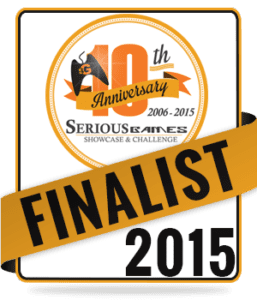 At I/ITSEC 2015, Stottler Henke’s Creature101, a serious game created to combat child obesity by teaching children to make better-informed decisions about diet and nutrition, was selected as a finalist for the Serious Games Showcase and Challenge (SGS&C). One of just fifteen finalists in this year’s Serious Games Showcase and Challenge, Creature101 features social networking and Flash-based games with pedagogical content, all based upon a proven school curriculum. The virtual environment presents a series of activities in a variety of forms, such as comic strips, video games, and multiplayer 2-D avatar interaction, most of which revolve around the care and maintenance of a virtual creature like a pet. Activities occur in the context of a portal, akin to a social networking framework, which allows tracking of activities and player success in those activities over time. Some activities also occur in a virtual world, where the user controls an avatar and interacts with other users and non-player characters in real time. The virtual world contains the user’s creature, other users, and a navigable environment in which health-related activities occur. As the students complete their learning activities—for example, playing a Flash game to categorize sweetened beverages according to sugar content—the game logs their accomplishments, enabling others to see their scores. The website then makes new learning activities available to each student. In December 2014, Stottler Henke was among a select group of companies chosen to receive the 2014 Northop Grumman Information Systems (NGIS) Supplier Excellence Award for developing advanced simulation-based training systems for the U.S. Navy. Northrop Grumman grants this prestigious annual award to only those suppliers whose financial, technical, management, and schedule-related business practices have been found by Northrop Grumman to have achieved, and maintained, the highest standards of excellence, and who consistently create the most innovative technology and highest-quality products and services for Northrop Grumman, and the U.S. government and industry customers whose aspirations the global security provider’s services and solutions realize every day. The exclusive circle of winners–over 70% of whom are small and socioeconomic business partners–of the 2014 award were chosen from among 3,000 eligible suppliers. Stottler Henke congratulates our fellow awardees! Examples of intelligent tutoring systems (ITSs) Stottler Henke has developed for the U.S. Navy and Northrop Grumman include the Advanced Reconfigurable-Naval Surface Fire Support Trainer (AR-NSFST) for certifying/recertifying Navy gun crews and the TAO-ITS for training Navy Tactical Action Officers. Stottler Henke has been honored with a Brandon Hall Excellence in Learning Award for its SimBionic® authoring toolkit which enables non-programmers to build intelligent characters for education and training simulations using a graphical authoring tool. These awards, bestowed annually by brandon-hall.com, an e-learning research and consulting firm, showcase exceptional work in the e-learning industry by providing feedback and benchmarking in an overall effort to advance the e-learning industry. NASA included four Stottler Henke systems in Spinoff, NASA’s annual premiere publication featuring successful spinoff technologies.